Having the ability to confiscate skateboards in the inner city would be ”extremely useful”, Dunedin police say. 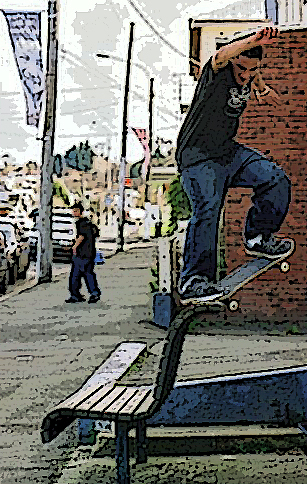 City councillors seem set to recommend that the power to confiscate boards from people riding in prohibited areas in the central city be added to a reviewed skateboarding bylaw. Submitted by Challispoint on Wed, 19/02/2014 – 9:59am. Sometimes I really wonder at the focus of our Dunedin City Council. With all the major issues and challenges they are facing they have decided to focus on . . . . skateboarding. After two days of public hearings (attended by four groups I understand) the staff are recommending that the current by-law be strengthened to allow “recreational vehicles” to be confiscated and the owner fined $100 if caught riding their scooter or skateboard in the central city area, the Gardens or St Clair. Today (Monday), Dunedin City Council agreed a set of resolutions to bring about relatively immediate changes to central city parking for assistance to retailers and local business in the run up to Christmas, in particular. The council working party has been constituted to examine the wider issues which lie with the parking strategy. Heaven knows what we will end up with if the council thinks buses (as we know them…) are a substitute for the convenience of independent car travel. Let’s leave that one for another day. The clamour for immediate parking changes in Dunedin has gathered impetus, as further protest appeared yesterday on city streets. Tuesday’s and Wednesday’s ODT carry more on parking, with D Scene featuring those responsible for the ‘bag protest’ last Sunday.